Cruiser Daily means: an agile Iveco Daily chassis in combination with a luxury-class coachwork. Just like the Charisma in the series of integrated motorhomes, the Cruiser Daily rounds off our product philosophy in the premium segment of coachbuilts. Your demands have contributed to the development of the new Concorde just like the know-how of our engineers and the commitment of our team. 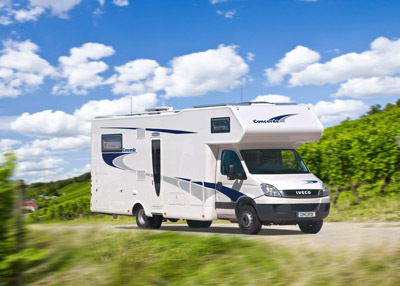 This motorhome comes up with six layouts and two rear bed variants, among them a classic of living room design: longitudinal single beds in the alcove and a large round suite in the rear. The functional and shapely design of the individual elements of the interior and the perfect workmanship of the vehicle production are advantages you are sure to get with every single model, just as the extensive, high-value equipment that makes this dynamic coachbuilt a Concorde of the premium segment. Get on a coachbuilt made to measure - coming the UK this early 2011.